Spring is in the air. It’s the time of nesting, sprucing up and cleaning out. We open the windows, bring fresh cut daffodils into our homes, put away the winter sweaters. We even clean out the refrigerator, wipe down all the shelves and make room for Spring produce. However, very few people clean out their pantry shelves. I mean, why should we? Most of what we keep on our pantry shelves won’t go bad. We can simply move it to the back of the shelf, just in case. But here’s a dirty little secret: There’s a connection between the weight we carry in our body and the food we shelve in our cabinets. 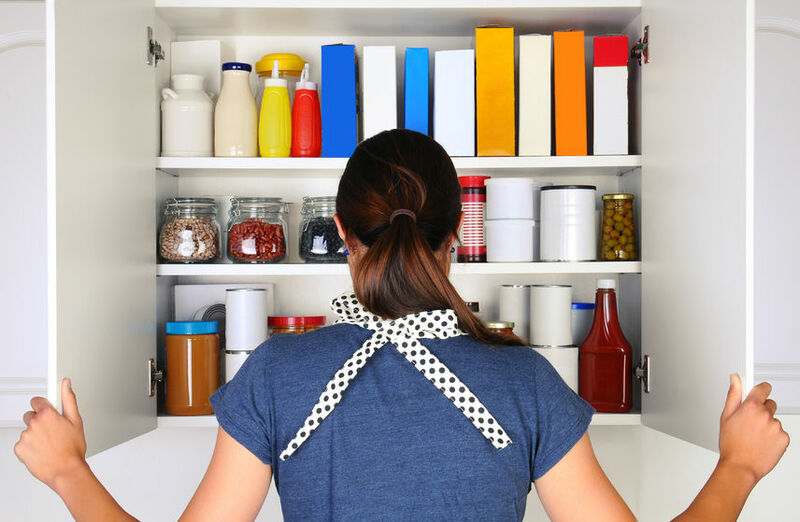 Clean Your Pantry, Lose Some Weight! There I said it. The cookies, the nutritionally-void crackers, the cans of junky soup, the white flour that’s been sitting there for years unused. It’s the same thing as storing stuff under your bed. You may not see it all the time, but you know it’s there. So let’s clear the pantry clutter and debunk some of the “natural” food claims along the way that marketers use to reel us in. Welcome to The Spring Pantry Clean-Out! 1. Discard obvious “junk” food. Unless it’s something you love and incorporate into your diet with healthy choices, Get. Rid. Of. It. Otherwise it’s only taking up space in your cabinets and in your head. You know it’s there, your head knows it’s there and every time there’s a trigger you have to fight the impulse. Why do that to yourself? Look at the ingredient list: Are the top ingredients truly whole grain? Or, like Maple Grove Farms of Vermont’s “All Natural Belgian Waffle Mix with No Artificial Colors. Flavors or Preservatives,” are you being sold a box of nonsense? The first ingredient is “wheat flour” and second ingredient is “whole wheat flour.” Look for the word “whole.” If it says, “Unbleached flour,” dump it. If it reads, “Whole wheat flour,” it’s a keeper. If sugar is one of the first three ingredients, consider it a dessert. That includes honey, molasses, agave, or any other of the “healthy” sugars. It’s all sugar. Does it have artificial sweeteners like aspartame, Splenda or xylitol? Dump it. any ingredient you can’t pronounce? It’s not food! 3. While you’re at it go through your spices and dump the old ones. Oh, you know, the one you bought three years ago for that special recipe? It has taken up space in the back of the cabinet “just in case?” Guess what? Spices lose their flavor and potency. Get rid of anything that no longer smells great, or you that you have not used in a very long time. You will be so glad you did! Extra Credit: As you clean out your pantry, make a list of items you need to replace and you will have it handy come shopping day. Thank you for the note, Lea. I know it always makes me feel better, opening up the cabinet, clean and organized … a sigh of relief. Happy organizing! Thank you, Melissa! I find that after I do de-cluttering, new inspiring ideas often come to me that help me in my life. Amazing how this works. Love “The Spring Pantry Clean-out”! I’ve become pretty good at reading labels and eliminating sugar, however, my spice cupboard could use a good cleaning:) Great info and tips! Thank you so much for this wonderful post and reminder. I always make sure that I have food I need. I never store ingredients I never use because it causes frustration and questions like “Now why I bought that?”. I usually do this during the week. it doesn’t take more than 15 mins actually (unless you have lots and lots of food in the pantry). This is so content-rich! A feast of ideas and invitations. Thank you, Melissa. Or on my WAV magazine, especially this week since the focus is Health & Harmony. I just went through my own major re-boot and walking back even into a “health food” store was overwhelming. I already have food intolerances and now mentally I am intolerant to less than thereof in health. I love how you showcase the nitty gritty of it all. There’s a guy in my house putting down two new floors. Somehow that has turned the whole house into chaos. Sorting spices and checking the status of the pantry might restore my sense of order. Thank you! Thank you for this! Great inspiration for taking action. Great tips. For me, every single one of those clean-out ideas of yours has been in place in my kitchen for years. Except for the dark chocolate, I guess. So for me, “lose some weight” involves other actions. Like portion sizes, and mindfulness. This is a great list Melissa! I’m going to clean out my pantry this weekend! Much love and blessings!